Red Devil. Thai Juan On. Menus are powerful tools for setting expectations in a restaurant. Though it may be an esoteric exercise to appreciate the menu as an individual item—instead of as a means to an end (that is, food)—we’re all influenced consciously and subconsciously by the arrangement of photos, text and numbers on any given menu. So what, then, do we make of “Thai Juan On’s” dish “Red Devil”? In short, if you can get past the pun, Thai Juan On is a bastion for imaginative fun. That imagination, thankfully, extends to the food. 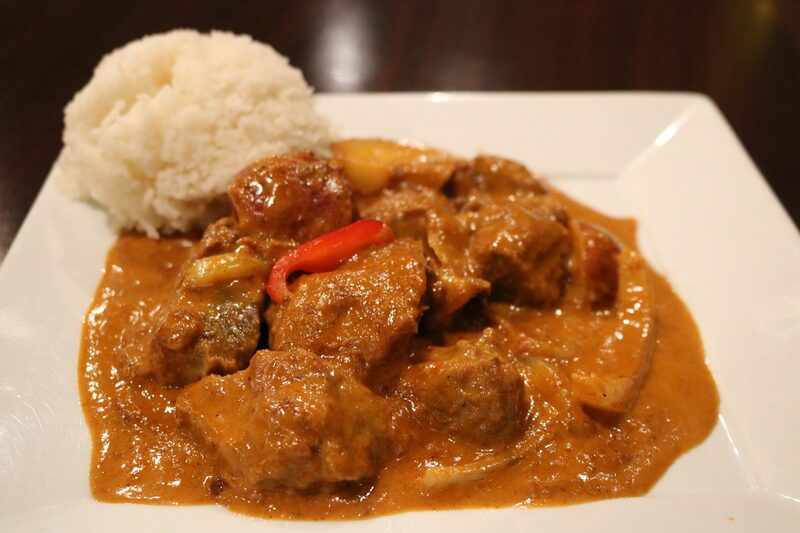 In the Red Devil, whose spiciness can be made to taste, chunks of pull-apart beef roast are simmered in a coconut milk red curry, and garnished with chunks of red potatoes, onions and peanuts. It’s an ideal dish for our recent rainy weather, warming the soul with the fattiness of beef, the richness of the curry and the familiarity of peanut. It’s meat and potatoes dressed up in a story, then dressed down to a casual, palate-pleaser.